The Herbert Protocol, a scheme to help trace people living with dementia more quickly after they are reported missing, has been launched in the North East os Scotland this week. The launch coincided with the start of Dementia Awareness Week in Scotland. Almost 23,000 people are reported missing every year in Scotland with over 500 of these reports relating to people living with dementia. In the North East, 4% of reports of missing persons in 2017/18 involved people living with dementia. The Herbert Protocol is named after Normandy veteran George Herbert who lived with dementia. He sadly died in 2011 after he went missing in England looking for his childhood home. The protocol was originally devised by Norfolk Police to compile information about a person which could be used if a vulnerable person was reported as missing. The protocol has since been adopted by other Forces across England and Wales since its original introduction. It is well known that people living with dementia can suffer from loss of short term memory but can easily recall memories from decades earlier. Sometimes we find that those who are reported missing are attempting to make their way to a place of previous significance to them. The Herbert Protocol consists of a form that anyone can access from the Police Scotland website. It can be printed off and completed for any vulnerable person where there is concern that they could potentially go missing in the future. The form records vital information such as where the person grew up, favourite places, former or current hobbies, GP contact details and also a picture of the person, with consent to share this on social media should it be required. If a person living with dementia does go missing, in addition to our usual checks of family members, last sightings, hospitals, etc. we would use the information captured on the form, to help identify where best to deploy our officers and issue appeals on social media and traditional media for any sightings. It can be distressing for family members to give important details when their loved one has disappeared so by completing the Herbert Protocol form before any incident occurs, it will make things easier for families and help officers respond more quickly. Although only 4% of missing person episodes relate to people living with dementia, by the nature of the vulnerabilities and high risks invariably involved, it is estimated that dementia-related missing person cases require two to four times the policing resource that would typically be engaged in a non-dementia related missing person case. By having this information already compiled it will save precious time and mean that enquiries can be progressed immediately, and tailored to the known details of that person. The Herbert Protocol is currently also used in Dumfries and Galloway and may be introduced by other divisions in Scotland in the future. In the North East a local scheme similar to that of the Herbert Protocol was used in the Garioch area from 2010. The Divisional Herbert Protocol launched this week will cover the entire North East division and will therefore supersede the former Garioch initiative. 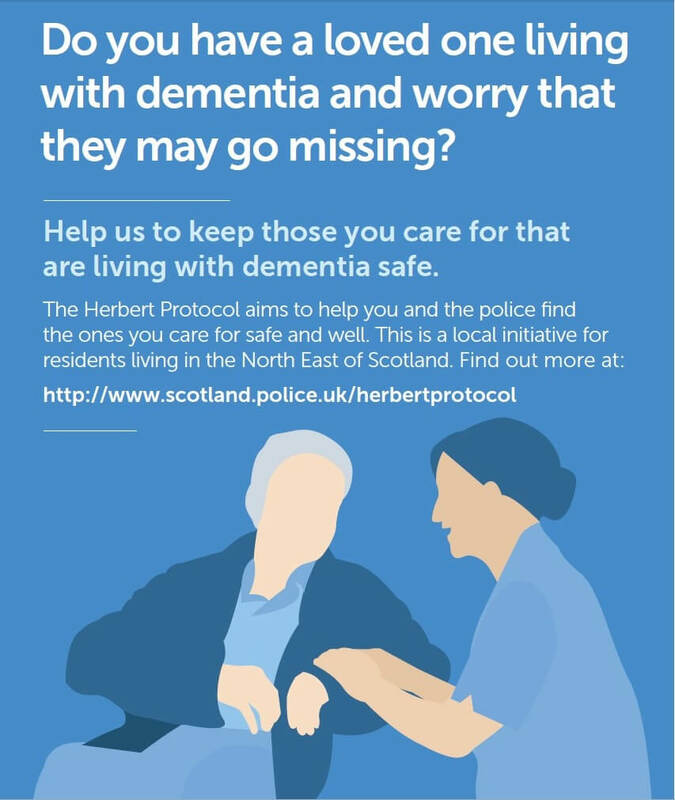 NHS Grampian are delighted to have worked in partnership with Alzheimer Scotland, VSA and other third sector agencies to support Police Scotland in the launch of The Herbert Protocol. It is important that healthcare professionals working in hospital, social care and voluntary agencies support people to live well with dementia and a vital part of this is future planning. We therefore encourage people at the stage of diagnosis and thereafter to complete the Herbert Protocol and keep it safe as a precautionary measure, should their symptoms deteriorate. This will enable the police to respond to a report of a missing person living with dementia in a timely, responsive way.